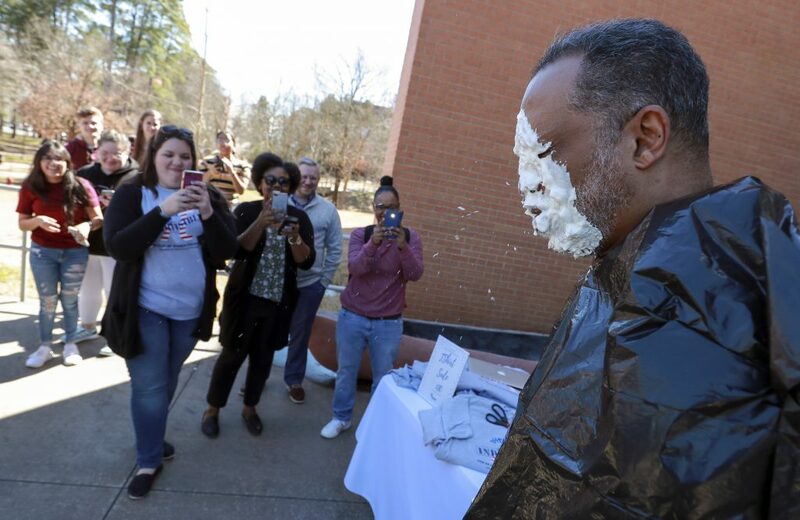 Vernard Henley, assistant dean of the UA Little Rock College of Engineering and Information Technology, grudgingly agreed that taking a pie in the face in front of a cheering crowd of UA Little Rock students and employees on Pi Day was worth it to support female engineering students. Henley and Amy Frets, EIT director of student services, were the two lucky winners who received a pie in the face after earning the most votes. Frets, who had been inside advising a student, lamented the fact that she did not get to see Henley take a pie to the face. Pi Day is an annual celebration of the mathematical constant pi (3.14), which is celebrated on March 14 (3/14). The UA Little Rock Society of Women Engineers raised $634 by holding a bake sale, selling T-shirts, and having an online auction of pies donated by students and faculty. For every $1 spent, a person could cast a vote for one of seven EIT employees who volunteered to get a pie in the face. The other volunteers included Dr. Lawrence Whitman, dean of the College of Engineering and Information Technology; Dr. Steven Minsker, professor of computer science; Erin Flowers, education counselor; Dr. Hank Bray, chair of the Department of Construction Management and Civil and Construction Engineering; and Dr. David Luneau, professor of electronic and computer engineering technology. In the final minutes of the fundraiser, the top three volunteers with the most votes (Henley, Frets, and Whitman) all worked hard to keep themselves from getting chosen. 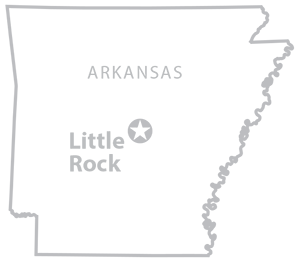 Frets donated $20 in favor of Henley, while Vernard donated $65 and even offered to match donations from the crowd toward Frets and Whitman. In the last five minutes, it looked as if Henley had been successful in his venture to keep himself out of the hot seat, with Frets and Whitman taking the top two spots. However, Whitman snuck in a last-minute $15 donation toward Henley’s camp to keep himself out of the spotlight. 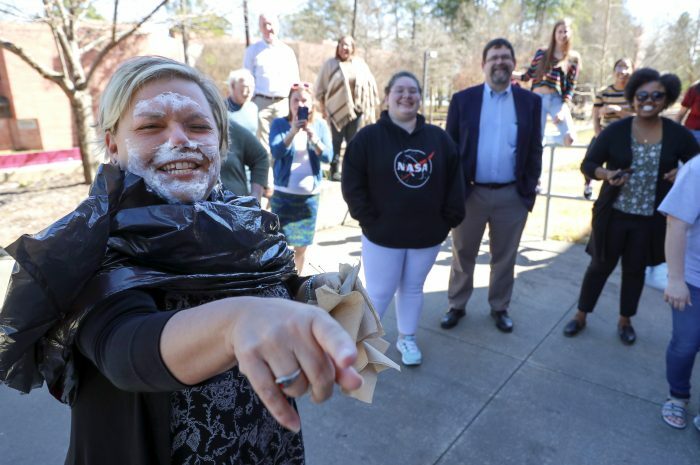 Amy Frets is all smiles after taking a pie in the face during the Pi Day fundraiser for the Society of Women Engineers. Photo by Benjamin Krain. Some members of the crowd actively lobbied for who they wanted to see get a pie in the face. Echo Davis, a sophomore environmental engineering major and vice president of the Society of Women Engineers, said the group is thrilled for the university community’s support. Anyone interested in joining the Society of Women Engineers can contact Echo Davis at ejdavis@ualr.edu or 501-701-8760. In the upper right photo, Assistant Dean Vernard Henley takes a pie in the face during a fundraiser for the Society of Women Engineers. Photo by Benjamin Krain.